Estuarine ecosystems are among the most productive ecosystems on the planet. Marine habitats are valued at providing an estimated US$ 14 trillion worth of ecosystem goods and services annually (or 43% of the global total), however, scientific evidence in the face of anthropogenic global change is showing many of these marine ecosystems are threatened ( Costanza et al. 1997 , IPCC 2001 ). Anthropogenic, or human, produced changes occurring upstream of estuaries have overwhelming consequences for estuarine systems as well as the social and economic structures that depend on them. Freshwater inflow carries nutrients and sediments to and provides low-salinity habitats for estuarine resources ( Montagna et al. 2013a ). Construction projects, dams, and diversions can remove freshwater from streams and rivers before it reaches estuarine systems. Changes within the dynamic estuarine ecosystems resulting from altered freshwater inflows are complex and implications for management will require compilation and interpretation of existing experimental results at the hydrological, ecological condition, and ecological resources levels. 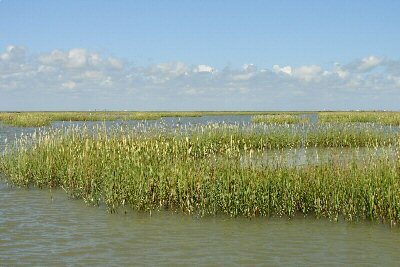 Freshwater Inflow Tools (FIT) is a web-based tool created to support coastal management decisions regarding freshwater inflow by providing the best available science-based information using Texas estuaries as the primary study area. This tool provides information on freshwater inflow, estuarine ecosystems, how estuaries are affected by changing inflows, and management implications.